Another week down and another week of using options to generate income. Despite the fact that I was sick for about 3.5 days last week I have to say I was quite surprised at just how many moves I ended up making. Of course most of those moves were made on 1.5 days that I was actually feeling well so those were some busy days. Without any more delay let's get into the option moves that I made last week. I really liked this put option when I originally opened it; however, there was one thing that missed at the time. That's the fact that Bank of America's next earnings report is due out the week that this contract expires meaning who knows what will happen. That isn't necessarily a bad thing; however, the implied volatility should remain high due to earnings meaning higher option premiums so I'll likely look to open a new position the week of the earnings report. This contract provided a solid return in a fairly short amount of time which is just how I like it. 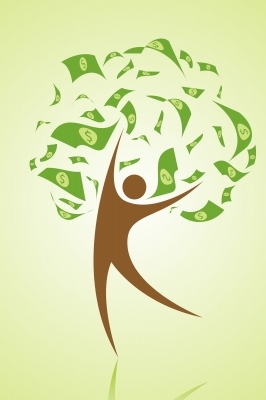 The net profit cam to $25.91 which is a 1.15% return on the $2,250 of capital required to secure the contract. That works out to an annualized return of 59.2%. I was able to capture 53% of the maximum profit in just 29% of the days til expiration. Whenever I open a new position I go and set up some good til cancelled limit orders to buy the contract back around the 50% of max profit level. That keeps me from being greedy as well as freeing my time up to look for other opportunities with options or just investing in general. However, sometimes that comes back to bite me because I feel as though I left quite a bit of juice on the table. I can't complain about making a profit but there was still some more to be made here. The net profit from this put option worked out to $39.91. Based on the $2,900 of cash securing the position that's a solid 1.38% return. The equivalent annual return would be a whopping 64.8%. 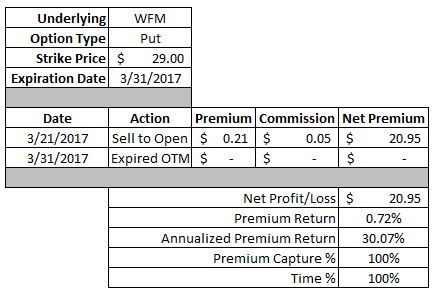 I was able to capture 53% of the maximum profit in 32% of the days til expiration. 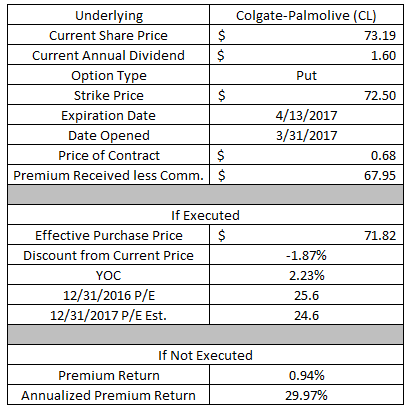 I was quite surprised to see this put contract get closed because Colgate's options market isn't exactly the most liquid. Plus the mid-price of the bid/ask was around $0.50 for this contract around the time it was filled so I was quite shocked to see the position get closed. Nevertheless it turned a decent profit and I decided to try out the wide markets in Colgate-Palmolive with this freed up capital by opening another position as I'll discuss later. This contract provided a net profit of $32.91 or 0.46% on the $7,100 of capital securing the position. However, the annualized return comes to a solid 20.6%. I was able to capture 52% of the maximum profit in 41% of the days til expiration. I had 2 put contracts on MasterCard that expired this past Friday; one with a $111 strike and one with a $112 strike. The thought behind it was to move my strikes closer to the current price in order to collect a larger premium and if they ended up being in the money just take the shares. The draw of this was that MasterCard's next ex-dividend date is this week so I'd collect the dividend and then be able to write at least 1 call contract prior to MasterCard's earnings release later this month. However, that plan is now out of the window since MasterCard's share price closed on Friday above the strike of both contracts. Just as with the previous MasterCard put option my thought was to be a bit aggressive with opening the position and moving closer to and ATM contract. The thought was if the shares were assigned to me I would then collect the next dividend payment and then potentially be able to write a call option expiring the week before earnings and then another one the following week when earnings were released. This contract provided a net profit of $66.95 which was a 0.60% return on the $11,200 of capital securing the position. The annualized return worked out to 16.8%. Since this contract expired out of the money I was able to capture 100% of the maximum profit in the full time the contract was open. Similar to the MasterCard puts, the Whole Foods one set up nicely. I was able to collect a decent premium on this contract alone and if the shares were put to me I'd also collect the dividend and be able to write a more aggressive call option for the earnings release later in April. However, Whole Foods' share price moved higher since then and closed trading above the strike of this contract meaning it was out of the money. This contract provided a decent $20.95 return from the option premium. On the $2,900 of capital securing the contract that's a 0.72% return or a 30.1% annualized return. 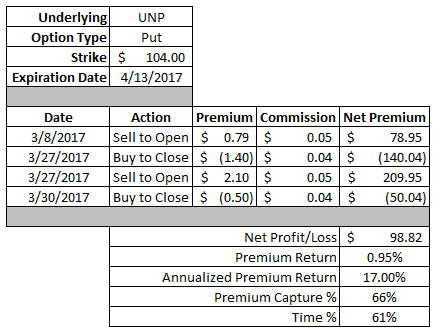 I was a bit too aggressive with rolling this contract because on this past Monday, the market and Union Pacific, sold off. Normally that wouldn't be an issue, but that left me with very little time until expiration on the original contract that was March 31. 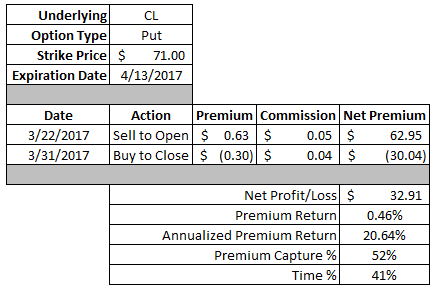 So I rolled it out in time and collected an additional $70 in option premium. I thought that would be the end of this contract for at least a week or so, but then Union Pacific's share price started rallying higher reducing the price of this contract which gave me the opportunity to lock in a solid gain. The net profit on this position worked out to $98.82 or 0.95% based on the $10,400 of capital securing the contract. The annualized return came to a solid 17.0% return. I was able to capture 66% of the premium in 61% of the days til expiration. With the iron condor you essentially create a range where you would earn the maximum profit by selling a put spread below the market and a call spread above the market. Since you're using spreads this is a defined risk strategy meaning that when you enter the position you know the most that you can both make and lose as opposed to many of the other strategies, including owning shares outright, where you have no cap on your losses. My realized profit on my first iron condor was a decent $35.64. That might not sound like much, but you have to keep in mind that I earned that with only $163.18 of capital at risk. Based on the capital in play that's a solid 22% return in about 2 weeks. 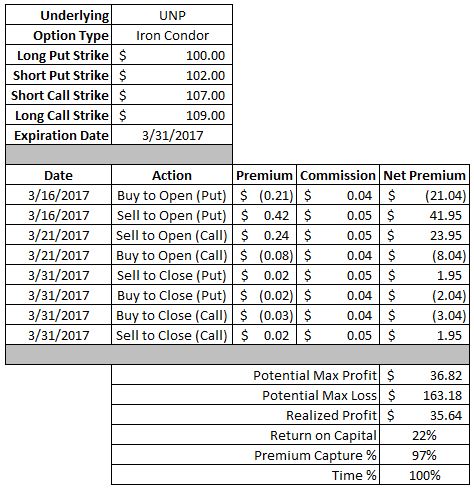 One thing you'll notice is that I bought to close this iron condor on expiration day rather than letting it just go through until expiration. The problem was that Union Pacific's share price rallied throughout the week and during Wednesday or Thursday the position was actually showing a small loss because Union Pacific's share price was trading above the $107 strike of my short call. Luckily the share price then dipped back down around $106.50 on Friday and rather than risk losing money if we saw a rally at the end of the day I just closed it out and locked in my profit. With expiration fast approaching I was a bit torn on what to do with this put option. Since GDX's share price was trading below my strike I could have taken assignment of the shares or I could roll it out. Normally the decision would just be to roll it out and buy myself time, but GDX has much richer call premium than put premium so it was tempting to take the shares. In the end though I decided it was best to roll it out in time because several of my other GDX and GDXJ option plays will be coming into play during April with at least 2 of them likely to be assigned to me. I was able to collect an additional $0.24 in option premium by rolling out just 2 more weeks until April 13th. The additional credit brings my total credits to $0.76. The original breakeven on the contract was $22.98; however, the credit received from rolling the contract out in time lowered it to $22.74. That's an additional 1.1% of downside protection. Not bad at all. Should GDX end up higher than the $23.50 strike the contract would expire out of the money. The return would work out to 3.25% or a 25.7% annualized return on the $2,350 of capital securing the contract. While I close out the majority of my option plays sometimes I do get assigned. That's exactly what happened with my Cisco put option that expired in the money this past Friday. That works out just fine for me though because the good thing about this contract was that I purposefully selected this because if it ended up in the money I would own shares just prior to the ex-dividend date and immediately get to start receiving dividends. So I'm now the proud owner of 100 shares of Cisco within my Rollover IRA. 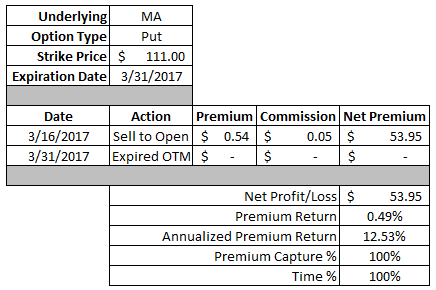 The strike price of this put option was $34; however, the premium received when I opened the contract reduces my cost basis. So my effective purchase price comes to $33.62. 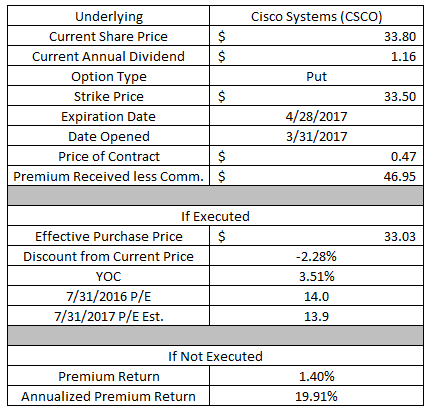 Based on the current annual dividend of $1.16 this lot of Cisco shares carries a yield on cost of 3.45%. Ideally I'd have liked to purchase shares lower around the $32 level so my plan moving forward will be to sell call options against these shares in order to further reduce my cost basis. With the success of the wide market Colgate-Palmolive put that I closed on Friday I decided to take a stab at opening another position. The wide markets surprisingly worked out nicely for me again here as the mid-price of the bid/ask was around $0.60 and I got a good fill at $0.68. If Colgate's share price falls below $72.50 then I'll have to purchase 100 shares at an effective purchase price of $71.82. The valuation there doesn't look all that appealing considering at 25.6x 2016's earnings and 24.6x 2017's estimates. However, it would be for a decent 1.9% discount from the current price of $73.19 and carry a yield on cost of 2.23%. If Colgate's share price remains above $72.50 then I'll get to keep the full option premium as profit. The $67.95 would represent a 0.94% return on the $7,250 of capital securing the contract. Through expiration that would generate an annualized return of 30.0%. If I'm assigned these shares then I'll look to sell an at the money or slightly in the money call option since Colgate has earnings coming out near the end of April. With the markets' almost incessant climb higher it's made it difficult to stick to my usual suspects for option moves and I've had to explore other opportunities. This is the first time I've used Qualcomm for a potential option play, but I like how things set up here. If Qualcomm's share price falls below the $55.50 strike price then I'll have to purchase 100 shares at an effective price of $54.83. The valuation looks pretty solid there at 12.3x 2016's earnings and 11.8x 2017's estimates. I'd be able to purchase shares at a 4.4% discount from the current share price with a yield on cost of 3.87%. 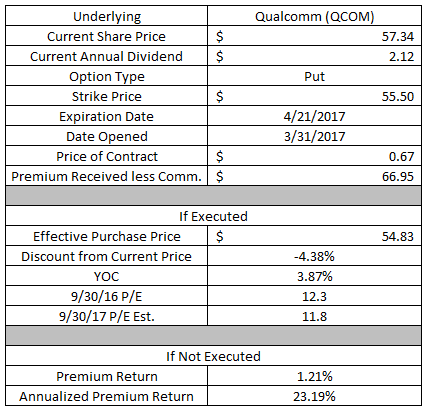 If Qualcomm's share price remains above the $55.50 strike then I'll get to keep the full option premium as profit. The $66.95 option premium would represent a 1.21% return on the $5,500 of cash securing the contract. The annualized return through expiration would come to 23.2%. I really want to build up my position in the railroads, Union Pacific in particular. I love the railroads because they have one of the best moats around: the government protected toll bridge. Plus it doesn't hurt that Union Pacific is essentially a monopoly/duopoly across 1/2 of the United States. That's a great position to be in especially since shipment by rail is one of the most efficient forms of transportation out there. If Union Pacific's share price falls below $104 then I'll have to purchase 100 shares at an effective cost basis of $103.22. That offers a decent amount of downside protection of 2.6% and those shares would carry a yield on cost of 2.34%. The valuation looks okay at those levels, although it's not a screaming buy. Based on 2016's earnings the valuation would be 20.4x and based on 2017's estimates the valuation would be 18.4x. If Union Pacific's share price remains above $104 then I'll get to keep the full $77.95 option premium as profit. Based on the $10,400 of capital securing the contract that would be a decent 0.75% return. Through expiration the annualized return would come to 13.9%. I selected this contract for a specific reason and that's that it gives me plenty of options to adjust my position. Union Pacific has earnings coming out the following week so if Union Pacific tests or goes through my strike I'll have the ability to roll the contract out just one week for an additional credit. Based on Friday's closing prices I could move this position into the following week at the same strike and collect an additional $0.90 in credit or roll it to the following week and down to $101 strike put and collect around a $0.10 credit. I'll likely be looking at opportunities to open up a second position that expires the week of earnings over the coming weeks preferably with a strike price below $100. As I mentioned earlier I now own 100 shares of Cisco within my Rollover IRA. However, there's still some decent premium to be had in Cisco and I still have room to add some more shares, especially since I'll be selling calls against the shares that I now own. If Cisco's share price falls below $33.50 then I'll have to purchase an additional 100 shares of the company at an effective purchase price of $33.03. This lot of shares would carry a yield on cost of 3.51% and would be at a 2.3% discount from the current share price. The valuation looks pretty good there at 14.0x 2016's earnings and 13.9x 2017's estimates. If Cisco's share price remains above $33.50 then I'll get to keep the full $46.95 option premium as profit. That would be a solid 1.40% return on the $3,350 of cash securing the contract and a 19.9% annualized return through expiration. March was a solid month in terms of generating option profits although not quite as strong as January or February. In March I was able to earn $909.63 in net profits and YTD I've already made $4,132.57. Looking forward to options expiring this next week there's 3 options that will need my attention. The first and most crucial will be my GDXJ $39 put. Since GDXJ is still well below the strike I'll need to weight whether there's more to be made by rolling the contract further out in time or locking up the capital by taking shares and selling calls. With my $23.50 GDX put I will look to make the roll/take share decision until Friday and my Pfizer $34.50 put could go either way depending on where Pfizer is trading on Friday. I will also look for other opportunities to sell either call/put credit spreads or enter into another iron condor position. I need to learn option strategy. I have no idea whats going on lol. Great results, so close to $1,000. Nice options performance. Also good stocks pick for trading options. Some are on my watch list but some are not. Thanks for sharing it. I added them and I will be reviewing them for my next trades too. Good job!